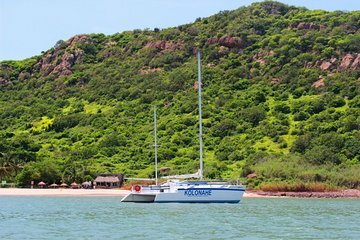 Accedi al remoto Deer Island (Isla de Venados) in questo tour di vela di un'intera giornata da Mazatlan. Salite a bordo di un catamarano per una crociera di 2 ore che include un open bar; una volta raggiunta l'isola, goditi un pranzo messicano tradizionale. Trascorri il tuo tempo esplorando a piedi o praticando uno degli sport acquatici previsti, incluso lo snorkeling con una guida. The adventure was great once it got started. The location on where to meet wasn't explained very well. All we were told to meet at the El Cid Marina so we waited out front for a shuttle or guide. We didn't realize that the excursion check-in was at the backside of the hotel. Better instructions are needed. Once we were out on the catamaran, it was fun. Great service on the boat and off. The snorkelling was boring because there's not a lot of reef where we were but the water was refreshing.